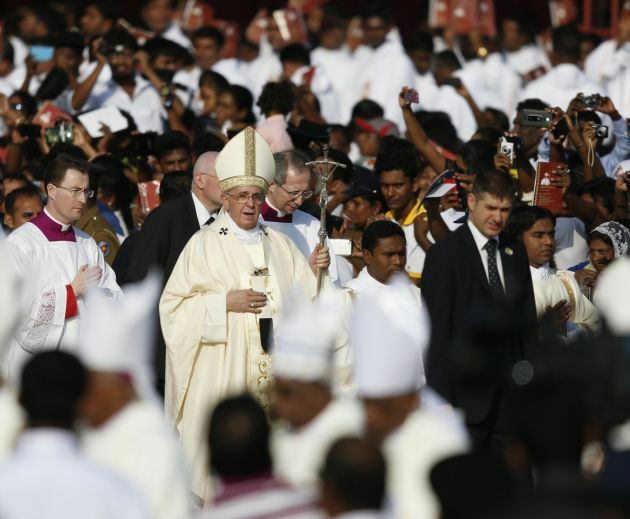 Pope Francis has canonized Sri Lanka's first Christian martyr while reiterating a call for freedom of worship, particularly for persecuted religious minorities as he spoke before hundreds of thousands of people on a Colombo beach. Francis spoke in English, Tamil and Sinhalese in a mass January 14 when he canonized Blessed Joseph Vaz, an Indian-born priest who came to Sri Lanka during the 17th century, The Wall Street Journal reported. Vaz worked across religious differences for reconciliation at a time when Dutch Calvinist colonists brutally persecuted Catholics in a period of history when Protestants and the Church of Rome warred with one another. "As a priest of the Oratory in his native Goa, Saint Joseph Vaz came to this country inspired by missionary zeal and a great love of its people. "Because of religious persecution, he dressed as a beggar, performing his priestly duties in secret meetings of the faithful, often at night. His efforts provided spiritual and moral strength to the beleaguered Catholic population." Vaz kept Catholicism alive during Dutch rule. He was imprisoned at one point and died in 1711, The Wall Street Journal reported. "Saint Joseph shows us the importance of transcending religious divisions in the service of peace. "His undivided love for God opened him to love for his neighbour; he ministered to those in need, whoever and wherever they were. His example continues to inspire the Church in Sri Lanka today," said the Pope. Francis has sought to create more saints for Asia, in particular has exalted Christian martyrs and those persecuted for the Catholic faith. St. John Paul II beatified Vaz during a 1995 trip to Sri Lanka. In September, Pope Francis waived the standard need foe the confirmation of a miracle and approved the canonization. During the Mass attended by hundreds of thousands of people, the pontiff likened the striving of Vaz to problems currently faced by Christian minorities around the world. "Like ourselves, Saint Joseph Vaz lived in a period of rapid and profound transformation," Pope Francis said. "Catholics were a minority, and often divided within. There was occasional hostility, even persecution, from without."